1. 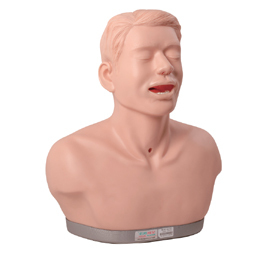 The model is a simulated patient of upper body. Pharynx and larynx structures could be clearly observed. 2. Use spatula to conduct indirect laryngoscope operation, laryngology examination training. 3. Carcinomatous mass of 2cm could be seen above the cartilago epiglottica. 4. There is built-in light sensor, using spatula or indirect laryngology examination to check lesions. When operation is correct, there is light irradiation, electroic display will be lit up and buzz apears.